Cathay Pacific Airways received the first of 22 A350-900s on May 28, 2016 becoming the fourth Asian airlines to have this aircraft in its fleet. It will make its inaugural flight to Manila on May 31, 2016 (News – February 15, 2016). Find out more about the Airbus A350 Family (Insight – January 2016). Here are some pictures reported by Ming Pao News on May 30, 2016 from the delivery and media day. The A350-900 will be configured with 214 seats in Economy Class with a 3-3-3 configuration. The seat design is similar to the ones found on board the Boeing 777-300ER currently. The tray table has been updated to handle smart phones and tablets for better entertainment viewing. The A350-900 is configured with 28 seats in Premium Economy with a 2-4-2 configuration. These seats have a new design and feature swing up footrests. Pitch is improved by 5% or 2 in (5 cm) to 40 in (102 cm) from the same seat on board the Boeing 777-300ER. Width is decreased by 4% from 19.3 in (49 cm) to 18.5 in (47 cm) in order to include more storage space for tablets. The seat tray has been designed with space to hold smartphones or tablets for BYOD viewing convenience. The inflight entertainment screen has been beefed up to 12.1 in (31 cm). That’s an improvement of more than 14%. Business Class will have 38 seats in a 1-2-1 configuration. The seat design has been modified from the one used on the 777-300ER currently. Studio F.A. Porsche refined ergonomics and improved storage space around the seat (near the side table, under the ottoman and near the knees). The inflight entertainment system receives a boost to 18.5 in (47 cm). That’s an improvement of up to 15%. Additionally, Studio CX includes updates for do no disturb (overall and at various meals). Pitch remains at the same at 75 in (191 cm) at lie flat position. While width is decreased from 21 in (53 cm) to 20.2 in (51 cm), the less than 5% decrease will not affect overall comfort (especially on side sleeping position where designers improved the knee zones). Cathay Pacific Airways will offer live TV channels and inflight internet on board the Airbus A350-900 aircrafts. Passengers will be able to catch BBC, CNN and Euronews for free. Internet access charges are based on time (i.e. without data limits) and will range from US$10 to $20 per flight. *Selective top tier members of the airline’s Marco Polo Club will be given vouchers to redeem for internet access. The first commercial flight for Cathay Pacific’s A350 would be to Manila (MAN) on May 31, 2016. Follow its first flight (CX907) here on FlightRadar 24. 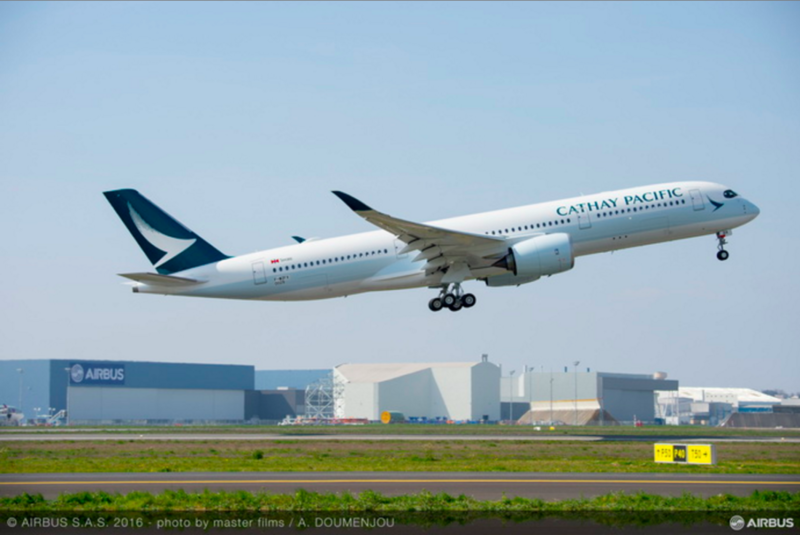 Like its competitors, Cathay Pacific will use the Airbus A350 mainly for international routes. The configuration of 280 seats will put it behind Boeing 747-400 and 777-300ER. With a lower density configuration and without a first class, the airline will likely place this aircraft type on routes with a lower yield / demand. Destinations with commercial service currently like Dusseldorf, Toronto, San Jose, Manchester, Milan and Rome may be candidates for this aircraft. Cathay Pacific can also explore new destinations to serve with this aircraft. They may include Honolulu, Miami, Philadelphia, Washington DC, and Abu Dhabi.